Burkarts Woodworks specializes in quality millwork with a level of service unmatched in the industry. 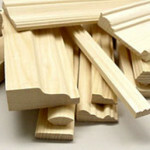 We are happy to help you get the lumber, custom trim, or other millwork to finish your project. Whether you are a homeowner that is interested in replacing some old and damaged wood trim or you are a professional contractor that has a large-scale order for thousands of feet of lumber, we can help you. If we don’t already have the stock profile, we make it! We offer a full line of custom made stock wood items that are used in St. Louis homes. If our stock styles do not fit your exact needs, we can reproduce nearly any wood trim style for your custom millwork request.